Codeigniter is a powerful and lightweight framework for developing web applications. As a web developer sometimes you need to add dropdown inputs in your web application form; but further more you like dropdown inputs which are populated with data from the database. In this tutorial I will guide you through step by step toward adding this type of input in your application. Remember in this tutorial i will not cover form validation and processing, this will be covered in another article. I hope you have created a database and connected it with your Codeigniter application. If not yet do it; you can follow this guide. Create table named “job_positions” and populate it; use the snippet bellow. 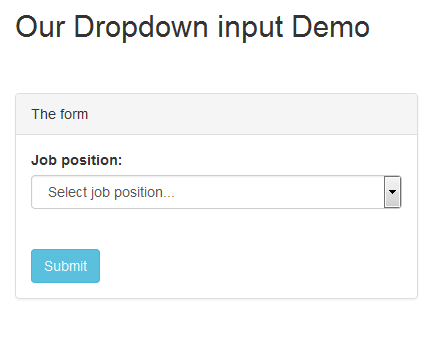 Create Controller named Job_positions and add the following snippet. This controller fetches data from Job_positions_model and passes it to view. Remember you need to load the Job_positions_model, form helper and Database; for me I have loaded database and form helper in auto-load; also you can auto-load model. Read more about Codeigniter loader class here. Next create a view file named Job_positions_view and add the following snippet. Note: I will add bootstrap to make my input looks nice. Finally save and preview your work through www.yoursite.com/index.php/Job_positions. I hope everything go right; please provide your feedback in the comments bellow. Thank you for reading.